The bus was at 5pm. I was a bit relaxed in office. I had a very late lunch - as I got out from the restaurant after lunch, I realised that I was a bit late already. It was 1530 by then. I had to travel across the City to reach Satellite Bus Station to get into my bus on time. BMTC was kind to me as a Majestic bound bus turned up soon after I reached the bus stop. Traffic too was kind to me as the bus rolled into Majestic by 1600hrs. 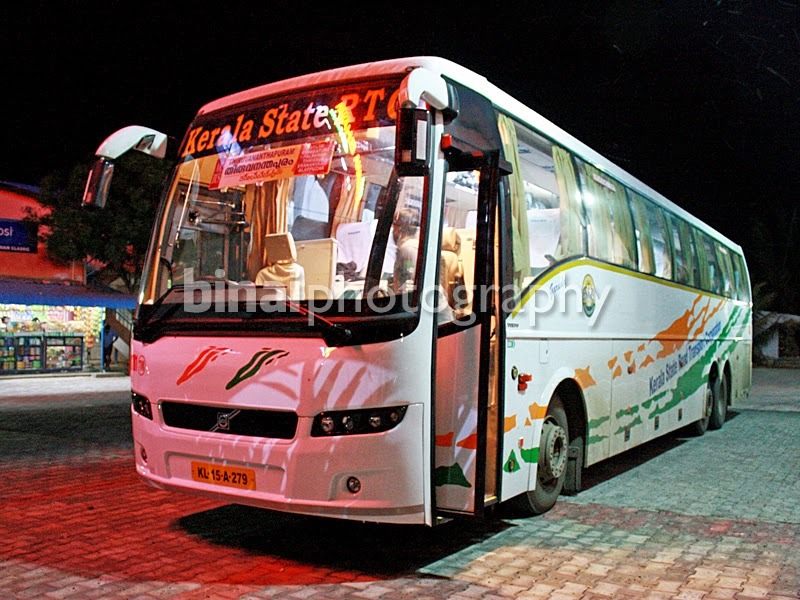 I rushed to the KSRTC terminus to get a shuttle bus to Satellite BS. God was kind to me here as well - a Shuttle bus was ready to leave as I reached there. Grabbed a seat quickly, and the bus dropped me at Satellite BS at 1630hrs sharp. As I reached the BS, my bus for the evening was getting ready for the 700-odd kms run. The drivers were known, and they waved at me as soon as they saw me. RS781 being brought in for passenger pick-up. After a quick visit to the washroom, and some "stocking", I got into the bus. 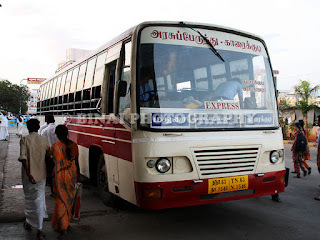 The bus was RS781 from Trivandrum depot. There were two drivers and one Conductor for the trip. The reservation chart showed that the bus was fully reserved that day. Boarding was quite slow - very few passengers get in at Satellite - majority of the boarding takes place at Madiwala and Electronic City. We started off from Satellite Bus Station at 1704hrs. They played some old movie songs on the AV system. The driver struggled a bit with the bus - the crew were new to the bus - so they were still getting adjusted to the torque and length of the bus. The bus jerked forward with every gear change. The driver struggled to keep pace with other vehicles in traffic signals. We had to wait for two turns to clear the signal at Hudson Circle. After all the lugging and struggling, we pulled into Madiwala St.John's hospital bus stop at 1759hrs. All the crowd got in here - not less than 20 pax got in. Now most of the seats were taken. It took some time for the people to get in, and we started from there at 1805hrs. Traffic was not very heavy - but the driver was slowly loosening in and adjusting to the bus. I was expecting him to take the BETL (which is the usual habit of Garuda crew) - but he shocked me by going below the flyover. We picked up one passenger from Bommanahalli (1816hrs) and continued towards Electronic City. We reached Electronic City at 1835hrs - so thats 30 minutes from St.Johns! Some passengers got in, and we started moving at 1837hrs. But the run did not last long - the bus was parked on the road side near the BETL Toll gate - it was 1839hrs then. The drivers got off the bus was walked towards the back - I wonder what was the "scene". In the meantime, the conductor was talking to a passenger on phone asking where he was - now I understood that we had missed a passenger at Electronic City bus stop. The pick-up point for Kerala RTC is a confusion - especially the one at Electronic City. 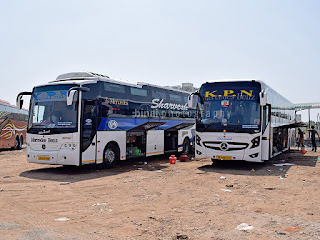 While Karnataka RTC and TN-SETC picks up passengers at Electronic City BMTC Depot, Kerala RTC's pick-up point is a little before the depot - its the bus stop near Electronic City Phase-I. The passenger turned up, and we started off at 1846hrs. The crew did not shout or misbehave when the passenger turned up. By now a movie was being played - instead of playing new ones, the crew played a classic movie - a perfect weekend movie. The driver slowly picked up more pace as we passed Hebbagodi. The bus during dinner break. I was now glued in to movie. We passed Hosur at 1920hrs - since we were full, the driver took the flyover. Past Hosur, the driver got faster. We pulled into Hotel Saravana Bhavan 'Classic' near Krishagiri for dinner, at 2001hrs. This is a fairly new place - it has a fairly big parking, but the restaurant isn't very big. I wasn't feeling like having dinner - so settled for some light snack, and was back at the bus. The place was swarming with flies (Winged Termites). The bus was parked under a light with the doors open - the bus was now swarming with termites. The drivers were informed and they quickly removed the bus from that place and parked it away from the light. We started after dinner at 2035hrs.The second driver took over now. This guy was a bit slow - he was very cautious when overtaking, and taking his sweet time to hit 80kmph (the set top speed). I slept off sometime in between. The seats had art leather upholstery - it was bit uncomfortable. The sleep was quite continuous. I was woken up hearing a commotion in the bus - and I could see fireworks outside. We had reached Thrissur, and we were stuck in the traffic block due to the famed fireworks related to Thrissur Pooram - the annual festival at Vadakkumnathan Temple in the city. We slowly crawled into the bus station - the bus station was chocked with passengers and buses parked in every corner. Lot of people were seen sitting on top of the buses parked there to witness the spectacular firework display. Thrissur was reached at 0324 - a lot of passengers got off, and a similar number got in. We started off at 0335hrs. The first driver took over again. The conductor took some time to finish issuing ticket - hence the lights were left on for that long. I somehow tried sleeping soon after lights were turned off. Sometime later, the bus stopped again - somewhere in the middle of the highway. Two people got in, the lights were switched on again. I was a bit upset now - why the hell was the lights on now? The guys who in were Ticketing inspectors! So a checking at such an odd hour in a long distance premium bus? The guy took his sweet time checking tickets, and the lights were on that long. In the mean time, we stopped at Ankamaly to drop a passenger (0420). We reached Aluva at 0435hrs. By now checking was over, and the inspectors were seated at the front. All my sleep was gone, and I now decided to see what was happening on the road. We reached Edappally at 0453hrs - the inspectors got off here. I was a bit worried if they'd enter the town and go to the bus station - but they stuck to the bypass instead. We reached Vyttila junction at 0500hrs. I hoped they'd go to the mobility hub, but they preferred stopping on the highway itself. Going to the Hub would've served as a small refreshment/rest room break for the passengers on board. The crew used this stop for light refreshments. We started off again at 0507hrs. I tried sleeping a bit again, but in vain. I switched on the GPS as we started off again. The bus was reporting 75~80kmph steady most of the time. We reached Cherthala at 0539. Once we entered the 2-lane road after Cherthala, the driver felt at home. He was quicker and more efficient on 2-lane than in 4-lanes. He maintained pace even with heavy traffic. The bus stopped at Alappuzha YMCA Junction at 0604hrs. I briefly considered getting off here and taking an auto to the Bus station (Volvo services do not go to the Bus Station in Alappuzha - for some vague reason) - bot then ruled out the idea. I continued on, and got off at General Hospital (erstwhile Medical College Jn) at 0606hrs. I took an auto from there to my final destination - some 15 kms away. Conclusion: The bus, KL-15-A-279, had some 7K kms on the odo.The bus was locked at 80kmph. 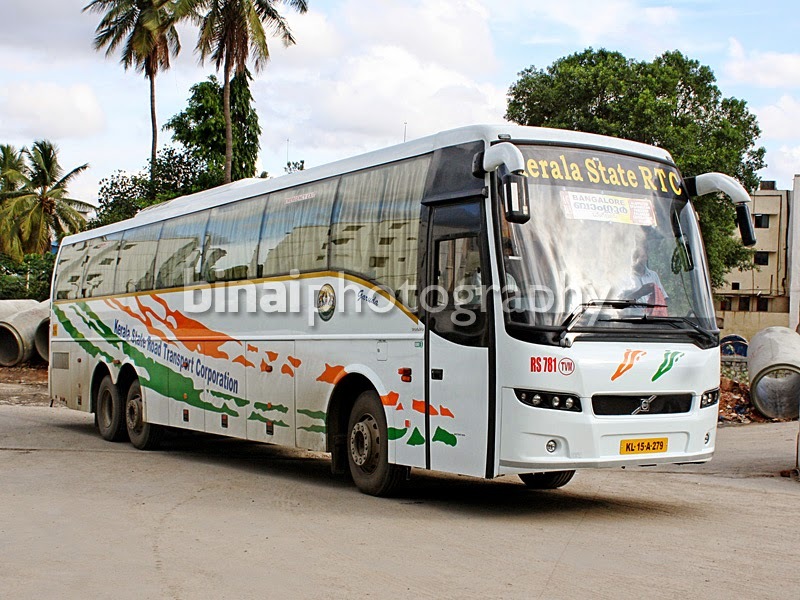 She was kept in good shape by Trivandrum depot. The crew were okayish - they weren't very friendly to passengers, but were certainly not misbehaved. KSRTC needs to have more clarity on their boarding points so that confusions and misses can be reduced. A very limited number of blankets were distributed - it doesn't give a great impression, IMO. Reportedly a fresh stock of blankets would be supplied shortly. The running time, of 13h02m, was slightly high - but understandable considering the fact that its a new bus, with new drivers and a speed lock at 80kmph. Both the drivers were cautious - they kept horn usage to the minimum, used indicators while changing lanes and used flashers while overtaking. The bus was kept clean inside (it was dirty outside due to rains the previous night). Maintenance: Too early to rate. Will I take this service again? Yes. Certainly. This service is at a very nascent stage - so let it take some time to settle down. With high hopes, I travelled in 18.30 EKM BLR Volvo on 13th. The service very much lacked professionalism. They didn't play any movie or music throughout, no blankets as usual. In the night they switched on lights wherever they wished which created a big disturbance. The drivers could not control the bus properly, the bus was going off all the time when they tried sharp turns in low gear. 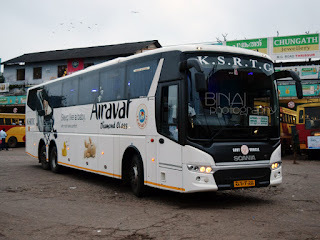 Airavat drivers lug the engine so much in high gear but never once I saw them losing control or bus going off multiple times. The crew really are newbies in handling. The white seats covers are bad-can get dirty very soon. Comparing with Deluxe, it took much more time for Volvo! My last week journey in EKM DLX took 11 hrs and 45 minutes and TVLA DLX took 12 hrs when I travelled in March. But Volvo took 13 hrs 15 Minutes today. EKM TSR (21.30) took 3hrs alone, due to high traffic and narrow roads, TSR PLKD took 3hrs again (00.30) including food and refuelling. Again to CBE 1 hrs 45 min (02.45). Crew lost their way in PLKD town and headed to KKD! One passenger helped to bring back the bus to correct route. We reached Hosur at 07.10 and Electronic City by 07.45. I told them to go via BETL & they did but took 1 way pass telling that return they will come under. I really doubt if speed governors at 80 is worth outside Kerala-they should make it 100 at least. . Premium ----- not so premium. With MPS of 80kmph other Volvos and even Ashok Leylands will overtake it. Ticket checking at 4 am. Are they insane ? I'm sure they will 'pick up speed' in the coming days ... this should be on a trial for couple of months for the drivers to understand the behaviour of the vehicle... ticket checking at 4am ? now that's a killer !